This entry was posted in Uncategorized on January 31, 2017 by Gary. 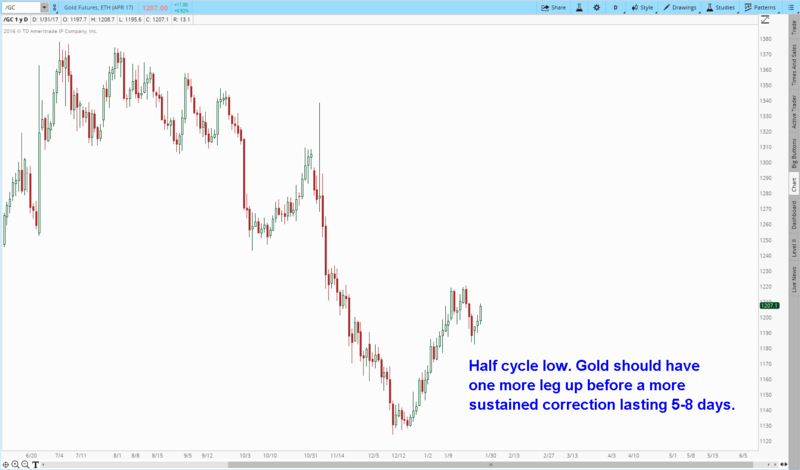 Just watched an OI-analysis for Gold, this is different from a cycle analysis. An OI is indicating that an event of great significance is about to happen 🙂 a major breakout coming? 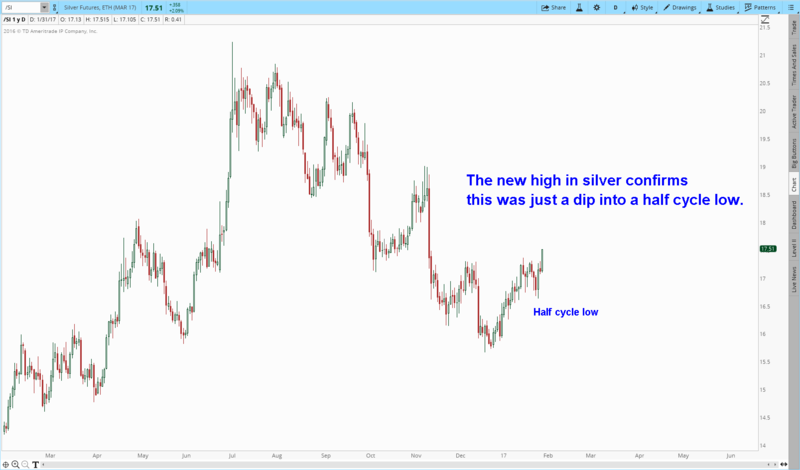 Looking at Silver the action has already started in line with #Option Traders comments lately ! Still watching Silver here to be sure the day ends strong. If so… we all have a special gift here. Gold might be decreasing its coupling to inverse USD? Gold itself might be the messenger to tell SM is going down. I made two posts several days ago about the Chinese holidays and gold being manipulated while their gold traders were away from their desks. How before the holidays the SM could be preset with some rises and then drop significantly to have a gold play while the Chinese traders are away. Your last post seems to be playing out with a scenario I suggested over a week ago. You were not keen on it.. Which was a gold rise into Feb 7-9th. nothing to write home about. Gold bulls are not in the clear yet. I have a feeling we could see some nasty surprises to the downside by end of trading day tmr. Pretty much everything I’ve been predicting is now coming to pass. The dollar is collapsing. The euro is rallying. Gold is resuming its bull market, and it’s decoupled from bonds. It took a little longer to happen due to the election night manipulation in the stock market, but it hasn’t stopped the moves from coming. Only delayed a bit. I think “dollar is collapsing” is a bit much, no? it’s still above 100 so I don’t think it’s really collapsed yet. Also, you have been pretty adamant about the miners starting to rally hard since early Jan and they really haven’t gone anywhere yet. JNUG is still under $9. Acting pretty weak today in my opinion with gold up $20. The dollar is well under 100 and Jnug is up over 100%???? Good stuff. Hope no one missed this. USDJPY just broke 112.50. Silver broke 17.50. Both should be rocket fuel if they hold. We could be starting a big leg up? It seems I am being treated with ignore. I hear what you are saying Gary. I have been saying for two years that the stock market is going to go down and I will stick to that prediction until I am vindicated. There’s no reason for stocks to enter a bear market. We aren’t in a recession, and aren’t even close to beginning one. I do think stocks should be allowed to have normal corrections though. By not allowing the market to correct naturally it sows the seeds of complacency. And that’s what creates bubbles. The PPT isn’t doing anyone any favors by trying to short circuit every corrective move. I hope that changes with the Trump administration, but I don’t have high hopes. lol gary, think don was being facetious there. I don’t see the PPT interfering anymore. The FED is scared to death of Trump and they will want things to look as bad as possible for him. 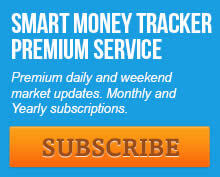 I think allowing the market to decline is in the cards and it will without anymore cheap money. interest rates are going up faster than what anyone expects, that is my prediction for 2017. Don’t be surprised if the stock market continues to go lower. My theory is this: The establishment does not like Trump and if Trump is not willing to play ball with them then they create chaos in the markets to make Trump look bad. The establishment controls the central banks and other financial entities. Both of you are nuts, good luck with JDST lol. Today is a strong day for gold. A better place to short would be gold at $1220 guessing for a double bottom. 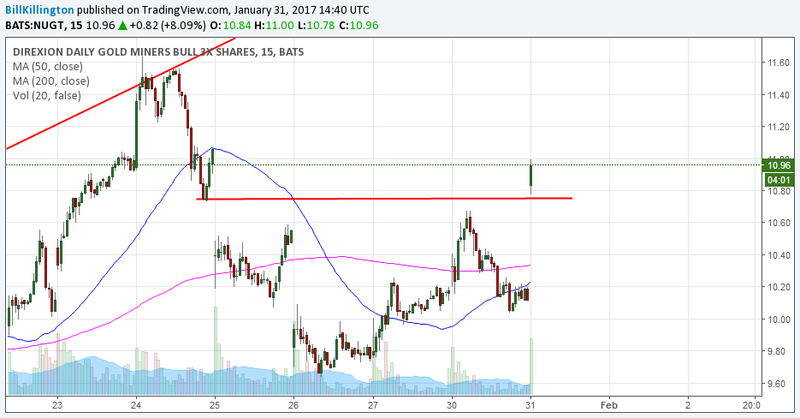 Though with SM perhaps correcting may have instead a breakout. There is only vacuum to hold its freefall down. I’m shocked that i am the first to acknowledge the bullseye-spot on call by Ped yesterday. “Nice call” would be a gross understatement. I am really impressed. Oh, now you are just being mean. I am not deterred however so waiting is now the name of the game. I think we have a turn-down coming but if I am wrong that’s OK too since I didn’t buy anything new. In this case I prefer to just bide my time and let the market decide what it will do. Actually I will be surprised if gold goes higher but stranger things have happened and we can’t rule it out. The bear channels on both gold and silver are still intact. Today’s action made no big difference to the daily chart since the passage of time has allowed one bounce more than my earlier calculation. Regrettably however, if silver goes higher again I will take a loss on DSLV. It happens. (crying moticon goes here). Good luck on that position. As soon as you cover and take the loss, silver will drop. That’s how things generally work. I know 🙂 …which is why I am still holding on. I hate losing. More than poison. Especially when I am sure my trade is correct. Time will sort it out. I’ve been there many times. Its like they are just waiting for you to bail before going in the direction you thought it would go and you end up losing money on a position that you could have made a nice profit if you would have just held a little longer. Holding on because you hate losing and being sure that your trade is correct is a sure-fire way to lose money. Half of being a successful trader is knowing how to lose money with a plan….knowing your exit BEFORE you initiate the trade to contain any losses. Just hating losing and being stubborn and thinking that knowing youre right is a good reason to stay in a trade is a recipe for disaster. All true Epiphany. You nailed the focus on the human nature side of my comment which is emotional. Maybe I should try harder to contain that part of my personality since its nothing to write about about anyway. Everyone hates losing on a trade. The part of the comment you overlooked though is that I am trading technically and I still believe I am on the correct side of a trend, albeit early. So a decline that puts me underwater, while unwelcome, does not deter me or cause me to sell prematurely at an unnecessary loss. Come on Bill. What do you expect me to do? I think you know, but just to be sure – I was dead serious Ped. Great call. Accurate in time and price. Thanks! Ped, I am surprised that you are still riding DSLV down. You are normally pretty quick to cover when things are not going according to plan. You must be very sure that the silver rally is a fake. Yes, I know its not ok to write that out loud! On the other hand, if gold breaks out tonight count me in the bull camp and I will switch sides. Since I am so loyal to gold. what would you consider a breakout? I am eyeing 1221, until then all bets are off. Anything above 1225 will set the alarm bells off in my head. There is a possibility that this topping pattern since middle January could still turn into an expanding wedge. The end result will still be the same with an eventual decline but it will take a little longer to complete. JDST ended the day just a few cents higher than the low of the day and made an effective bottom. It could have a really strong move up tomorrow or the next day if gold rolls over. That’s what I am thinking is in the cards but the Gods of the market often have another plan. On the daily chart you can see its making a symmetrical triangle. My guess is that it breaks out once the pattern is done. I have been watching it daily waiting for the end to arrive. The center point is about 37 and a half and it could break out at any time now. XBI is energized. The biotechs are going parabolic is what I heard months ago. You are a comic, man! Don’t make me laugh too much. I think he is serious fella who has made many correct predictions. In fact he is a real genius. Buy jnug now that gold has been decoupled from bonds. But then gold is about to correct. Worry not, all mistakes are corrected in a bull market. Even those who bought jnug at 32 will make money. But, most people never makeven any money because they sell. Worry not, all mistakes are corrected in a bull market. Even those who bought jnug at 32 will make money. But, most people never make any money because they sell. Those who don’t know jnug has already gone up 100%.